Don't roll your eyes at me, but I'm going to wait to share the winner of the $100 Farmhouse Light Giveaway until the end of this post! I'm curious, when you were growing up, were you an eye-roller? I was an eye-roller to beat all eye-rollers, especially during my teen years! My brown orbs were rolled often (usually at my mother and mostly behind her back), expressing my teenage disgust at practically anything and everything. While my teen years may be long behind me, I've been told that I still roll my eyes - usually at the goofy punchline of one of Mr Diy's jokes, or at a statement made by one of my kids. I usually don't realize that I'm even doing it; however, I distinctly remember rolling my eyes and sighing in disgust a few years ago when I was shopping for a Christmas advent for my young boys...all that the stores had to offer within my price range were cheap little flimsy cardboard Christmas countdown calendars with chocolate in the punch-out windows. Remember those? It wasn't even good chocolate! The calendars certainly weren't something you wanted to display! Thankfully the retailers realized that we consumers needed something better for our children and stores are now filled with cute and affordable advent boxes, trees, banners and pockets of all shapes and sizes. While the diy beautify family owns one of those afore-mentioned boxes - and it has delighted my children for years - I decided to turn an old shutter into a piece of Christmas farmhouse decor. My Christmas shutter advent is as decorative and charming as it is functional! And it was so easy to do, let me show you how! I've included the supplies list for this project after all the pretty 'how to' pictures. I started with a grimy old shutter that a friend pulled out of the trash for me (my friends know me so well!) After cleaning it, I painted it with creamy white chalk paint and lightly distressed it. Then I got started on the advent part. Jute cord was stapled to the shutter in a back and forth pattern. This will be so easy to remove once Christmas is over and I'm packing away my decor. I'll just pull the staples out and I'll be able to enjoy this white shutter in other areas of my home all year round! Miniature envelopes were stamped with numbers and red baker's twine was threaded through punched holes. The envelopes were clipped to the cord with mini clothespins. I added a few denim pockets for extra storage! They were simply cut off the backs of jeans my daughter had outgrown. The little pockets will soon be filled with treats for the kids. Things like chocolates and candies, gift cards for ice cream, hair accessories (you get the idea). This old shutter probably thought its days were long over when it was placed in the trash. 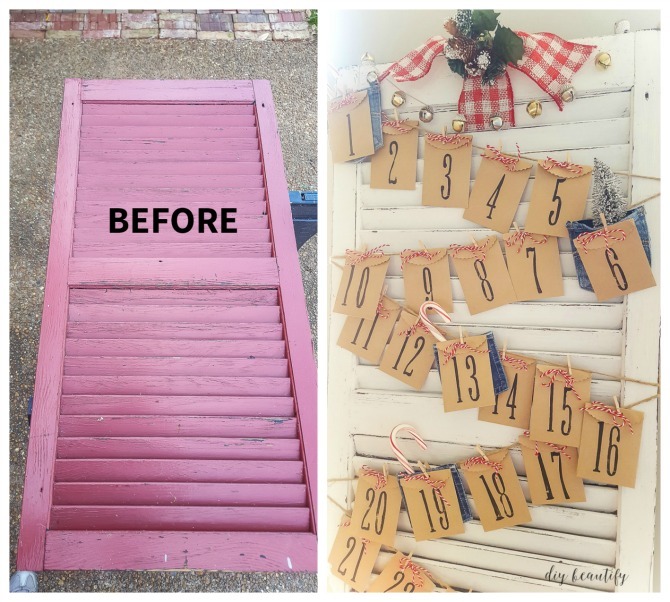 Making a Christmas countdown advent is a great way to reuse an old shutter. I don't anticipate any eye-rolling during the 25 days of fun surprises and treats! Something to look forward to each morning! 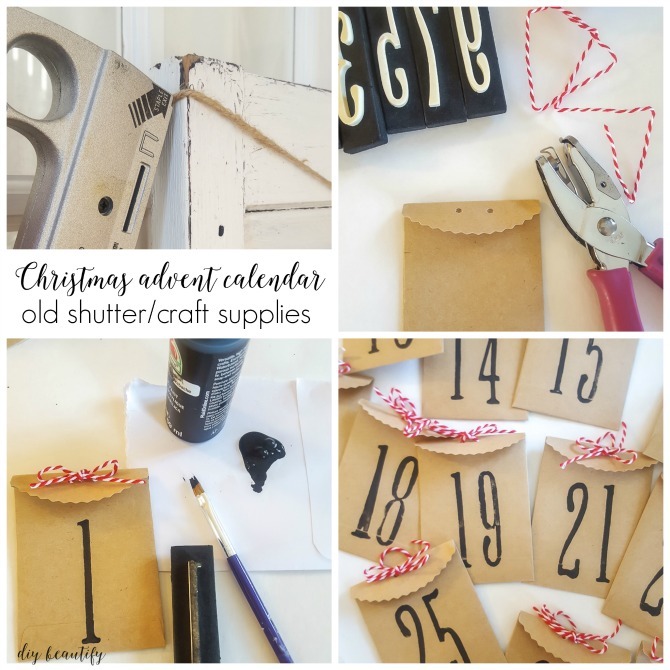 If you want to make your own shutter advent, here are the supplies I used. Affiliate links are provided for your convenience. You can find my full disclosure policy here. And now it's time to announce the winner of the Parrot Uncle Light Giveaway. Congratulations to Amy Cooley! I am sure Mr Diy's jokes are witty & thoughtful. this is so cute and cleaver. I love it better then a store bought one. Thank you Jolinda, I feel the same way! I love this project, Cindy! I didn't notice that on the initial tour! Love the idea!Thank you for joining the 12 days of Christmas Blogger tour Link Party!Merry Christmas!